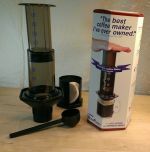 The amazing AeroPress espresso coffee maker will produce excellent coffee very quickly and easily. 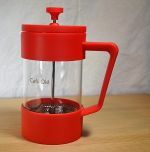 It takes 10 seconds to mix fine ground coffee with hot water in the lower AeroPress tube, then 20 seconds to hand press your coffee. 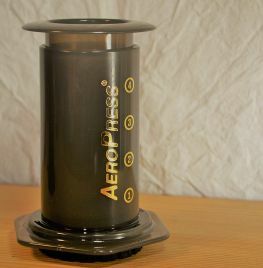 The AeroPress is easy to use, easy to keep clean and a great coffee making experience at home. 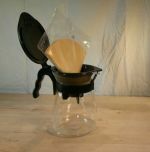 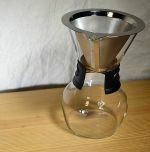 Use as the base for all espresso based drinks too - such as Americano, Latte, Cappuccino, etc. 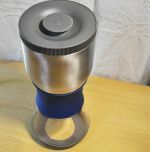 AeroPress is easily portable for weekends away or camping trips so you can make sure you take great coffee with you wherever you go. 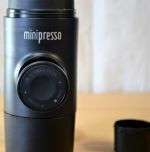 You may soon want an AeroPress to improve your coffee at work as well! 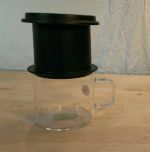 and VIDEOS for the AeroPress. 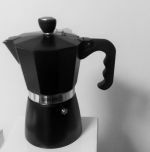 This coffee maker is so easy to use and produces great tasting hand made espresso in under a minute - add more water to make an Americano, or combine with milk for Lattes and Cappuccinos.